Commercial gift wrapping paper is often difficult to recycle these days - sometimes it simply can’t be recycled (see below for more information on the current situation in the UK). So, I’ve been having a lot of fun over the last couple of weeks putting together some unique, handmade, gift wrapping ideas that are also creative, eco-friendly and sustainable, for you to use as alternatives. And it’s not every day that I get the opportunity to use a quote from the Sound of Music in a blog post! I had fun creating and decorating my handmade gift wrapping above. Kraft paper (available in the ecru colour I used above, and also in black). Acrylic paint - I used white and green above, red would be fun too. A pencil with a round eraser on the end. 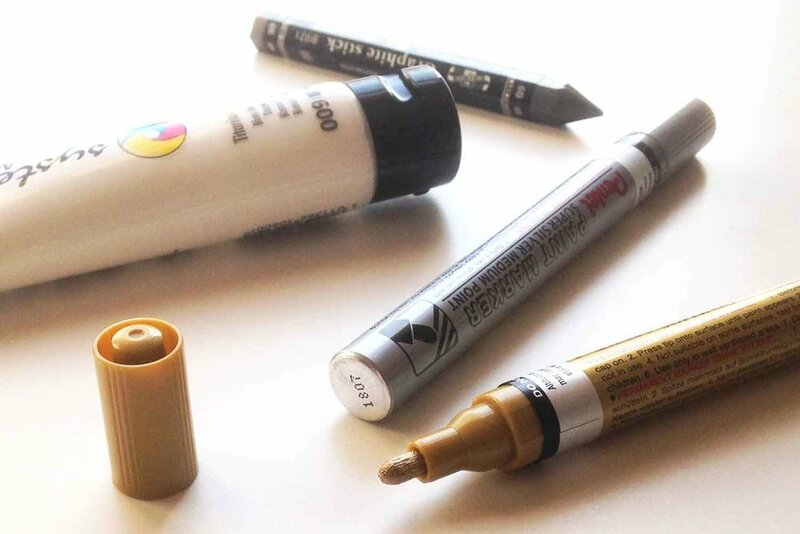 Thick pens - I used opaque white, gold and silver thick nib marker pens (see images above). Ribbon - mine came from my local haberdashery store but you can also find a good choice online. Wrap your gifts neatly in plain Kraft paper. If you like to be completely organised and orderly, before you begin you can plan out a grid for your dots onto your Kraft paper packages by making a little mark with a soft pencil where you would like each polkadot to be. However, I drew my polkadots freehand, placing them by eye. Squeeze a very small amount of the acrylic paint onto a paper plate or some thick scrap paper or card. Dab the paint with your finger to flatten it a bit so it’s not too thick (wipe the end of your finger to remove the paint before you go on). Dab the eraser end of the pencil into the paint. Test it out by ‘printing it’ onto some spare Kraft paper so you can get the feel for how thick or thin you want your paint to be when you print it. When you are confident with how much paint you need for each polkadot you can go ahead and ‘print’ your paper. I printed my polkadots onto the front and sides of the parcel but not the back. It’s up to you. Leave your parcels until dry - this could be up to 24 hours depending on the thickness of the paint in your polkadots. When they are dry you can add other decorations. I used ribbons, and leaves from my garden, for mine. I was able to buy all of the above in my local art and craft shop. You can also buy them online from the usual sources, such as Amazon, Hobbycraft, and many others. I wore protective gloves while printing my polkadots. Protective gloves can be standard washing up gloves or latex gloves if you have them, whichever you prefer. These paints aren't dangerous but wearing gloves just makes it much easier to clean up. I found this cozy gift wrap idea idea on Pinterest. And the fact that it’s a lovely eco-friendly way of reusing knitwear means it’s close to my heart… It took some tracking down but eventually I found that it came from this blog: boxwood clippings.com. Boxwood Clippings is written by sisters Sarah and Emily in the USA, and it’s full of lovely ideas. Big thank you to them for the idea and the pictures. Use old sweaters/jumpers you don’t wear any more, or get some from a charity shop or thrift store. Main picture: cut a section of the sleeve which is nice and snug around your gift and tie the sides in a decorative knot or bow as shown in the picture. Inset picture: cut a panel of the knit fabric to go round a decorative gift box. Inset picture: has a decorative bow made of a pom pom. See these instructions for how to make a pom pom - you need to go about half way down the page for the traditional (easy) method. If you have a problem with the edges of your knitwear fraying or beginning to unravel you could felt it - but only if it’s wool. Felting won’t work if it’s synthetic! To felt it you need to wash it in your washing machine at a higher than recommended temperature. Alternatively, if you have a sewing machine - zig zag the visible edges in a contrasting or toning colour thread to protect them. The end result is decorative and distinctive, and feels cozy - and it’s recycling so it’s thrifty, sustainable and eco-friendly! I love this idea… have fun with doodles to draw your own gift wrap! The lovely ladies from Boxwood Clippings sent me this idea which also comes from their blog. Check out their blogpost for this idea here. I had great fun - I used the thickest soft pencil I could find and, following their ideas, I doodled Christmas trees and other Christmas images, as well as more abstract images like ticks, crosses, zeros, stars etc. Big thank you again to Sarah and Emily for the idea and the pictures. A thick/chubby, soft black (or coloured) pencil. You could use A4 printer paper (raid the paper tray from your family printer!) for smaller gifts. Use larger sheets of paper from your local art/craft store to wrap bigger gifts. I was able to buy soft thick pencils and suitable paper in my local art and craft shop and ribbons in the local haberdashery store. I couldn’t get the butcher’s twine locally so I bought it online. All of the above can also be bought online from the usual sources, such as Amazon, Hobbycraft, and many others. I love the simple, elegant black and white colour scheme, which you can finish by tying with black ribbon or butchers twine. I found this lovely gift wrap idea on Pinterest too (if you’re not already a Pinterest addict - or even if you are - it’s wonderful… have a look here). I love Pinterest, but as usual some detective work was required to find the original writer and photographer. In this case it came from readingmytealeaves.com blog written by Erin Boyle. Again, the recycling idea is key - get discarded magazines and use the pages to wrap your gifts. Local hairdressers and beauty salons get through lots of magazines as they buy them in quantity for their customers to read. So why not ask them to save them for you when they’ve finished with them? Erin has used butcher’s twine and seasonal berries to make her gift wrap look extra festive. Thank you to Erin for the idea and the picture. Discarded magazines (NB don’t use newspapers or newsprint for this - the ink rubs off and will make your gifts look inky and grubby). Seasonal berries or other foliage. Butcher’s twine sourced online - as above. Berries and foliage from the garden. Old magazines from the local hairdresser. Is your gift recipient a rambler or geographer? Use discarded or out of date maps as wrapping. A child? Try pages from comics. Depending on the recipient, magazine subjects could be chosen for their relevance. Finding the source for this idea was also a challenge. I finally traced it to a blog called 100layercake.com - and they credited a website called ‘Whole Living’, which leads to an ‘error 404’ page (Ie ‘not found’). Cut nine strips from discarded magazines, each about 18mm wide. Three of these should be approx 27.5cm long. Three of these should be approx 25cm long. Two should be approx 22.5cm long. One should be approx 9cm. Twist each strip to form loops at both ends and secure the ends with double sided tape or invisible tape - as in the picture. Make the smallest strip into a circle. Layer and stick, beginning with the longest strips and ending with the circle in the centre. You can have a lot of fun choosing your colours… pages with lots of sky or sea in them to make blue bows, buildings to make greys and ecrus, human faces for pinks or browns, etc etc. I really struggled to find the original source for this image. Eventually I found the image on apartmenttherapy.com - and they credited it to goforth.com. But if you visit the page on goforth.com it leads to an error 404 page. So I’m no further forward. It’s easy to make spatter-painted wrapping - either on ecru or dark Kraft paper. In the picture (below right) you can see some of my favourite tools which you can use to make this. Paint - I used white. Or, a spray diffuser (see the picture below) (I’ve had my trusty spray diffuser since college several decades ago!). Squeeze some paint onto a paper plate. Dab the toothbrush bristles into the paint. Scrape across the paint-y bristles with a non-absorbent item like the handle of a stainless steel knife etc. This will make a spatter effect as you draw it across the bristles. You’ll need to point it away from you! It’s easy, but it’s best to test it out on some spare Kraft paper so you can get the feel for how far the spatter travels, and how thick or thin you need your paint to be for the effect you want to achieve. When you are happy with the amount of spatter you are getting, you can go ahead and spatter your parcels. Leave your parcels until dry - this could be up to 24 hours depending on the thickness of the paint you’ve used. When they are dry you can add other decorations like ribbon, leaves etc. You can achieve similar spatter effects with a spray diffuser - if you have access to one such as in the picture above (the small bent metal tube with a red plastic end). The red plastic end goes in your mouth, the other end of the tube dips in the paint, and you blow! Everything needed for this can be found or bought locally. I had an old spare tooth brush and the spray diffuser already in my tool kit. Anything you don’t already have and which you can’t buy locally can be bought online if needed, from the usual sources, such as Amazon, Hobbycraft, and many others. Caution - make sure you use an old toothbrush and don’t try to clean your teeth with it afterwards!! This is another lovely idea. I struggled to find the source of the image but, finally, I think it’s www.liebesbotschaft.com. White paper from (art/craft shops). Both sealing wax and butcher’s twine need to come from specialist shops or online. It’s a lovely, simple but classy idea. Sealing wax and butcher’s twine can be bought in different colours, but I love the simplicity of the red on white. When you buy my knitwear and/or accessories you can make your choice from my lovely eco-friendly gift box options to add to your order. You can even add a personal message which I can include in the package, and it can be sent directly to the recipient if you prefer, and/or if time is short! My gift boxes and pillow packs are made from high quality recycled Kraft boxes or pillow packs, and you can make them doubly eco-friendly by reusing the boxes afterwards for storage, keepsakes etc. You can also make your choice from three different colours of ribbon for your gift. You can see all my gift wrap options here. My knitwear makes lovely and much-loved gifts for friends or family - and for you! I’ve included (below) a small selection, you can find more to choose from here, and you can read (here) some reviews that my customers have kindly written. Please don’t hesitate to get in touch with me if you have any questions. Can I recycle my gift wrapping paper? Well, the answer to that is ‘yes and no’! Some local authorities in the UK will accept wrapping paper in their home recycling collections. Some local authorities ask that wrapping paper should be taken to the local recycling centre rather than putting it into the recycle bin. Some local authorities won’t accept wrapping paper in any recycling, when it can’t be recycled in the local area. Why is some Gift wrapping paper not recyclable? Commercial wrapping paper often has additional elements in it, such as glitter, foil or plastic decorations. It is often dyed or laminated. It is often very thin so it doesn’t contain good quality fibres suitable for recycling. If it has sticky tape attached to it, this makes it difficult to recycle. How do I recycle my Gift wrap? Find out what types of commercial wrapping paper your local authority will, and will not, recycle. Remove any attached sticky tape. Remove any decorative bows and ribbons (reuse these if you can). Apply the scrunch test - as a general rule when you scrunch the paper in your hand, if it stays in a ball, you can recycle it. If it springs back, you probably can’t. If it fails the scrunch test, it needs to go in the general waste, not recycling waste. If you’d like to be kept in touch with my news, sales, events and offers you may like to join my VIP list by clicking the link below. I won’t make a nuisance of myself, I’ll only email you when I actually have something new to say!